Second one I bought. Got the plush again. Very comfy. Great buy for the price. Choose the amount of firmness you prefer for a restful night's sleep with this 11-inch memory foam mattress from Comfort Dreams. This memory foam mattress comes in your choice of plush, medium or firm construction, so you can select the perfect firmness level you want for your best night's sleep. The gel-infused memory foam cradles your body for comfort, and it's naturally antimicrobial and resist to dust mites for a healthy sleeping environment. Purchased medium firmness and it's perfect. Went back and forth on whether to get firm or medium knowing after a few years it will sag like all foam. Glad I chose medium because it feels hard as a rock when you first sit/lay but then you melt into it and it's perfect. Do no expect it to be squishy because it's not, it only sinks in a inch or so and we were skeptical by it has worked wonders. I am a side and stomach sleeper and my husband is a back sleeper. He is around 225lbs and I am around 140. i do not fall into a valley like i did on our $1200 mattress when laying in my side next to him. His snoring has also quieted down immensely since day 1 on this mattress. Hope this review helps! I purchased this mattress to replace my 5 year old Comfort Dreams 11 inch mattress. I originally picked "Soft" based on reviewers saying the soft was a firm mattress. While it was relatively soft, it was firm enough for me at the time. This time however, 5 years later, I chose Firm, and it certainly was firm. I like a firm mattress, but this was firmer than I expected so I added a Wool Fleece mattress topper to it and now I'm in heaven! The Gel memory foam is cooling, which in my case, can be too cooling, as I like to sleep warm but not sweaty. So the topper is also keeping me comfortably warm without overheating. All in all I am very pleased with this mattress, as I was with the first one. I figure the price, divided by 5 years, works out to about 18 cents a day to sleep in total comfort. Definitely a great buy! I would buy this mattress again, no question about it. I ordered this for my brother who is confined to a hospital bed. I needed a mattress that was an XL twin made of memory foam that was affordable and this was perfect. My brother is a large man 250+ and so far it is doing well with supporting him and he said it is very comfortable. Love it...but warning, "Plush" is not cushy! Purchased the "plush" queen for my 16 year old daughter's "pallet bed". 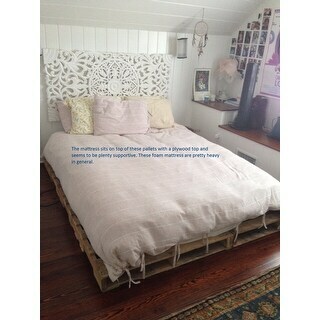 - Mattress was placed directly on top of pallets with a plywood top. (Apparently this is cool.) I also have a gel foam mattress myself by another manufacturer. It is difficult to understand the firmness level of these gel foams. You sink down into them and the heavier you are the more you sink. But once you sink down, there is a firmness feeling no matter what the grade (firm, medium, or plus.) I went with the plush for my daughter who is about 120lbs. I am closer to 140lbs and it feels pretty firm to me. My husband and I have a "medium" by another manufacturer and it feels even firmer to me.- In hindsight, I would have purchased a "plush" for us as well. If you have never slept on a Gel foam before, it is nothing like a regular mattress and will never feel fluffy like you are sleeping on a down pillow. Think of it more like a mold. You will sink down into it and once the mold is formed, you will be sleeping on a firm base. I like this because it molds to your body but you have good support. My mattress is a firmer rating and I don't feel like I sink down enough into the "mold". I like this Comfort Dreams in the "Plush" a lot better. Try to lay on one of these before you buy it online to be sure you like the feeling. It is difficult to return because it will expand when you take it out of the box and you will never get it back in. 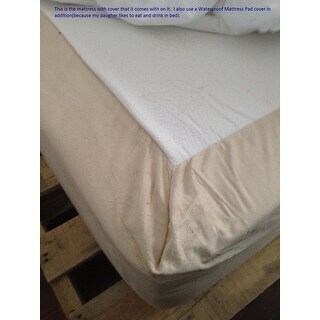 The mattress seems to be excellent quality and the cover is substantial. My advice, unless you are very heavy people, you may want to stay with a plush. My husband is 5'11" 180lbs and also finds our "medium" rated to be on the firm side. We bought a Comfort Dreams Select-A-Firmness 11-inch Memory Foam Mattress (Queen/firm) 4 years ago and it was good for us. The past Christmas we had a friend visiting and she loved our mattress and she got the order info from me and bought a mattress top when she went home. We decided to buy a new mattress for another Queen bed. The mattress came quickly and it is as good as we expect! Awesome mattress! I purchased the firm version. I was sceptical of purchasing a memory foam mattress as I am not small, tipping the scale at 300+ pounds. It is surprisingly firm and sleeps relatively cool. I have been sleeping on it for about 2 months now and couldn't be happier with it. Easy to set up, just placed it on top of my existing box spring and allowed a few days for it to fully expand. As with any memory foam mattress, it is difficult to sit on the edge of the bed as you will sink almost to the bottom. This only applies to the edges, the rest of the mattress supports well. Don't let the low price tag fool you...this is a high quality, very comfortable mattress. I thought I was taking a chance by purchasing this mattress...no regrets at all though. Hopefully, this review will give you peace of mind. It was a great purchase and I recommend it to all! Wonderful mattress at a good price. We ordered the non-gel version 5years ago and still love the mattress! The gel version happened to be a few dollars cheaper so we thought we'd give it a try after needing an additional mattress. So far, it is just as wonderfully comfortable as our original! I ordered two mattresses - one is medium and the other is firm. I find both to be very comfortable. My husband (225lb) thinks both are comfortable but finds the firm version to be more supportive for him. We are very happy with our purchase and so are our guests. We decided on the medium firmness for our new extra long bunk beds. The mattresses were going to a different location so I kept them in the plastic wrapping but I did cut open the wrapping to allow any orders to escape. There was no noticeable odor with this product. They were unwrapped on our new bunk beds and the plumped up nicely in short order. The mattresses are very comfortable. The description warns the exact length might be different due to machine cutting, both were a few inches short but this did not matter. Sheets fit, product fits, it was a home run for us! The mattresses may retain body heat, works for us because they now live in snow country. Good firm mattress. I needed a firm mattress and wanted a gel foam. I started buying my memory foam mattresses 5 years ago from overstock.com because I love to get my mattresses delivered with free delivery! The mattresses are great! These are fine mattresses of excellent quality. I have bought 3 mattresses so far And I plan to use Overstock when I need to replace these mattresses. So far, the mattresses are holding up like new so I don't know when that will be! I love a thick memory foam mattress because they are firm without being mushy. If you haven't tried a memory foam mattress, I highly recommend that you do. I will never buy a different mattress again. Really is cooler to sleep on. Very happy. We ordered a mattress for me (we have a split king adjustable frame). I raved so much about it that my husband asked to try it for a few nights. Reluctantly I agreed. He loved it and he is decidedly NOT a memory foam guy. So we ordered a second matress for his side, I found the medium softer than I expected, but not too soft. Definitely recommend! Not only the item was not as described but I had to pay in order to ship the item back. they said it costs $$ to ship the item back. since it was my first time buying they help me with half of the money to ship the item and put it as store credit. so have to spend $$ dollars in the store buying something that more than likely dont need. since all I wanted was a mattress. Super soft from the start, which wasn't a good thing. Now 8 months in, it's already softer and saggy. All in all, a real waste of money. UPDATE: Fifteen months in, I am DONE. We purchased this bed in Feb 2016 So we have had it for while. We love love love this mattress. It's extremely comfortable to sleep on, easy to keep clean, and doesn't make you over heat. My son loves it so much we are planning on upgrading his mattress also. This bed is so comfortable!! I only slept on it one night but so far so good. Its not as plush as I expected. So comfy and easy to assemble... yes I recommend this product! We just purchased our second of this same mattress. The other is 5 years old. We put it in the guest room. There are permanent indentations in it but it is still very comfortable! The new mattress we bought is firm... not 'hard' at all. VERY comfortable! ! Hubby is a large man and I'm petite. Suits both of us. Good value even if we have to replace every 5 years. Worth it considering how much time you spend in bed and the importance of restful sleep. Great mattress. Guests say they love our guest bed because of this mattress. Just like sleeping on a cloud. Springs back quickly so that you don't feel as if you are sleeping in a rut. One of the best gifts I gave myself. "Does this mattress contain fiberglass or any other material containing glass fibers?" "What is the shipping weight of the queen mattress? Thank you." The shipping weight is 110 lbs. "what are the dimensions? of the queen?" Queen dimensions: 11 inches high x 60 inches wide x 80 inches long. "Please give me a description of the firm, medium, and plush. Plush sounds wonderful but it may be too soft." "What is the warranty on this bed"
This includes a 10 year Manufacturer's warranty. buyer beware! If you do not purchase the warranty service plan, there is NO warranty. Overstock can't even find a manufacturer phone number to call re: the warranty. I've had my mattress for 2 years and it's sagging and lumpy. Thinking you have a warranty for 10 years but that's NOT the case. Do your own research on this company first! "Can this mattress be used with an adjustable base?" Yes, an adjustable base is acceptable. "I can't find a description of the difference in the firmness selections: medium, firm and plush. Comments? Thanks." I bought the firmest version offered (I do not remember seeing the option "plush" ) - I need a very firm mattress and got firm - I can sleep on it but would have preferred a firmer mattress. As I said, plush was not an option when I ordered, so I have no idea what that means. I ordered one medium and one firm mattress and they are both very similar, But I use a 2 inch goose down mattress cover on each and it is the best night sleep EVER. I have adjustable bed frames and the mattresses respond very well to the different positions, I would recommend these mattresses to anyone. Compared to the mattress stores these are a steal.